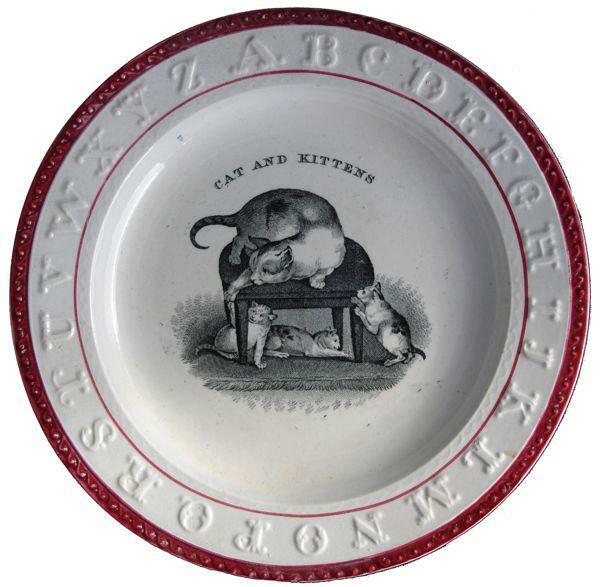 Child's plate with a molded alphabet border titled "Cat And Kittens." October 29 is National Cat Day. Cats are my favorite animals. I like all animals: dogs, horses, lions, giraffes, etc. However, I have chosen to live with cats for the last 47 years. I have had as many as seven (too many) at one time, but two seems to be a good number. The cats keep one another amused, and the litter box is not too onerous. 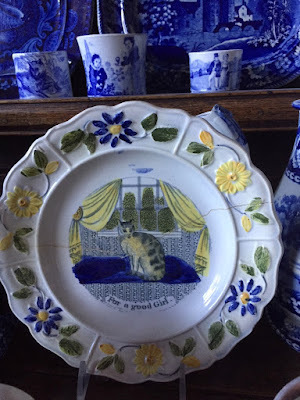 I didn't think cats were that popular on transferware pattern when I wrote my first cat post in 2013. I was wrong. 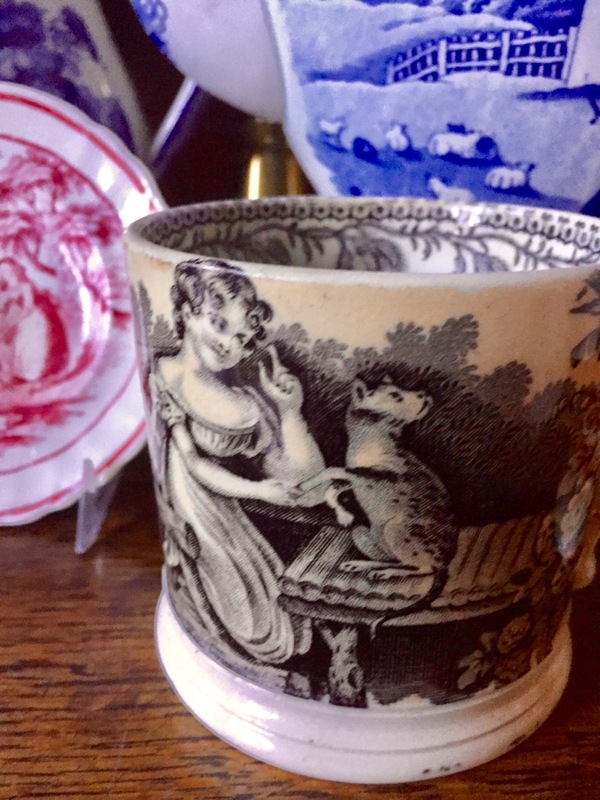 There are 106 patterns, so far, that feature cats in the database of the Transferware Collectors Club. Here are some more wonderful cat patterns that are from my own collection. 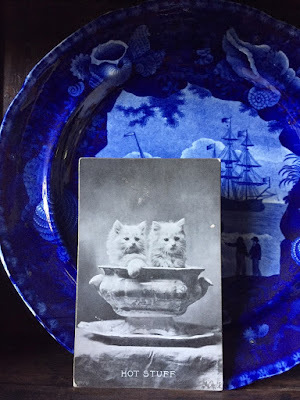 Since I can't easily collect real cats, I collect transferware that features cats. Some of my favorite transferware cat items. Click on the photo to make it larger. 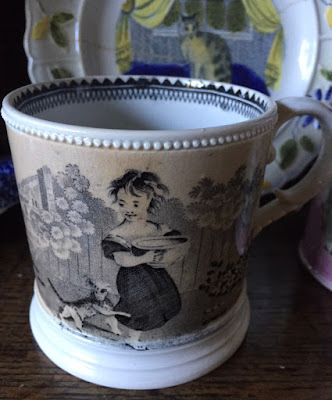 Child's mug showing a cat, girl, and bowl of milk. 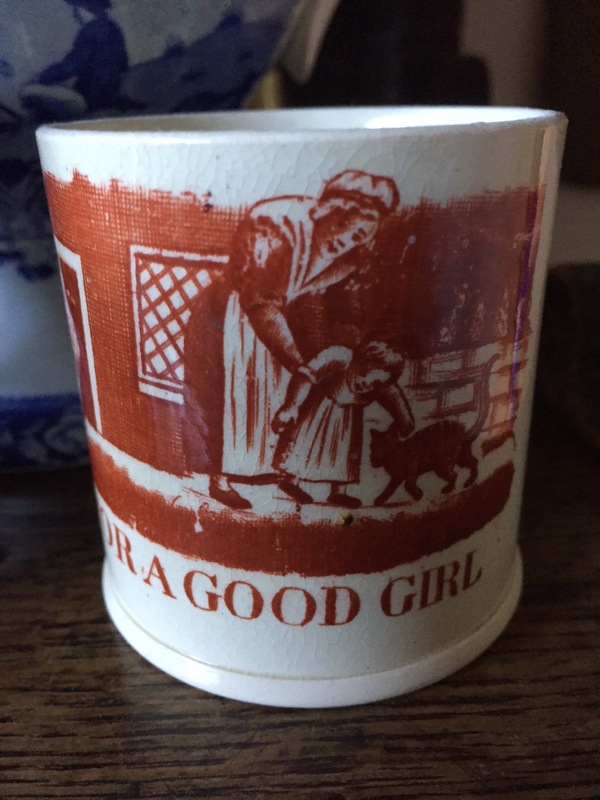 Child's mug "For A Good Girl" featuring a cat catching a rat. 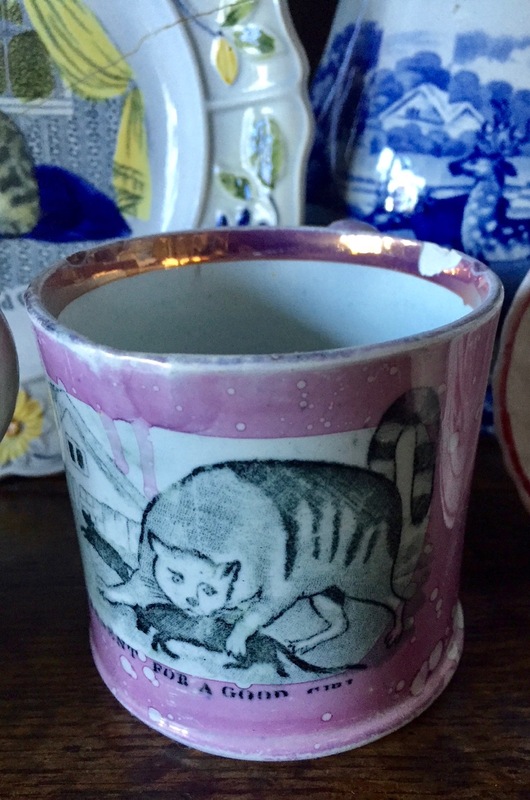 It's an odd picture for a child's mug, but I discovered that a similar image was used to illustrate "This is the cat that ate the rat" from the cumulative rhyme "The House That Jack Built." Four inch plate that shows a cat wearing clothes and walking on its hind legs! Child's cup that shows a cat ignoring a girl who is admonishing him. Although you can't see it in this photo, the cat is looking longingly at a bird! 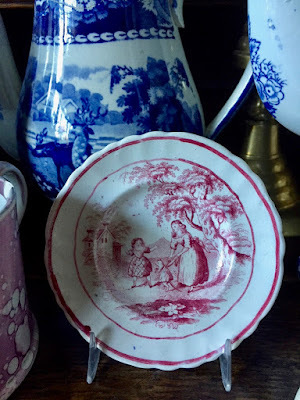 The pattern is sometimes titled "The Playfellow" or "The Favourite." 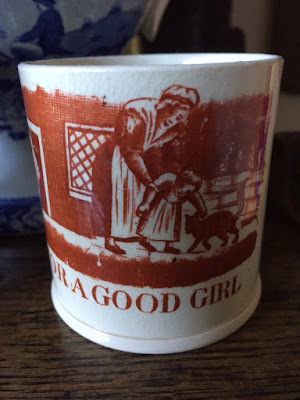 Child's mug with the caption "For A Good Girl." Her mother is helping her learn to walk. Notice that the girl is petting a cat. A child's plate "For a good Girl" shows a handsome cat sitting in the window. The source print is from Thomas Bewick's "A General History Of Quadrupeds." 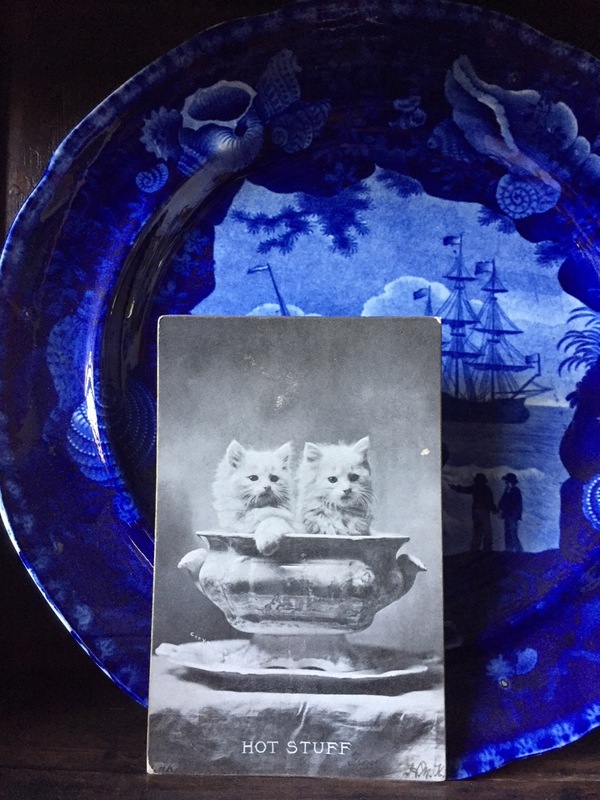 A charming post card from 1906 shows two kittens, perhaps Persian kittens, who are sitting in a 19th century transfer printed soup tureen. Can anyone make out the pattern? Can you call two cats a collection? 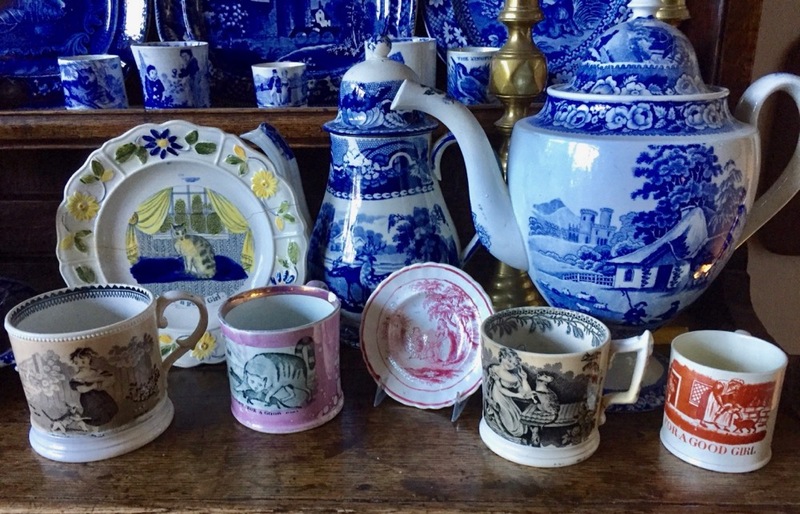 I was told you need three of anything in order for it to count as a collection. 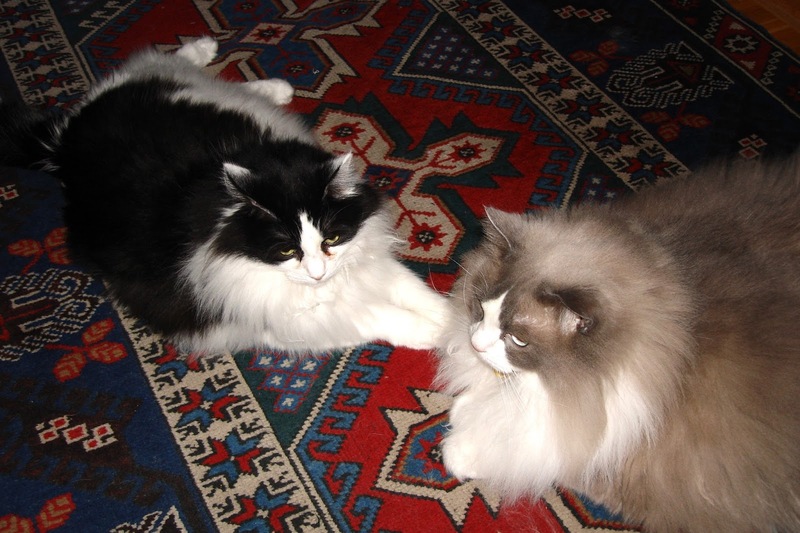 The cat on the left is Charlotte and the one on the right is Percy, aka Big Cat. On more thing, if you don't like cats, take a look at my blog posts that show other animals. Like dogs.